Keith McArthur | President and publisher of FanReads. I publish books about sports, screen and music. 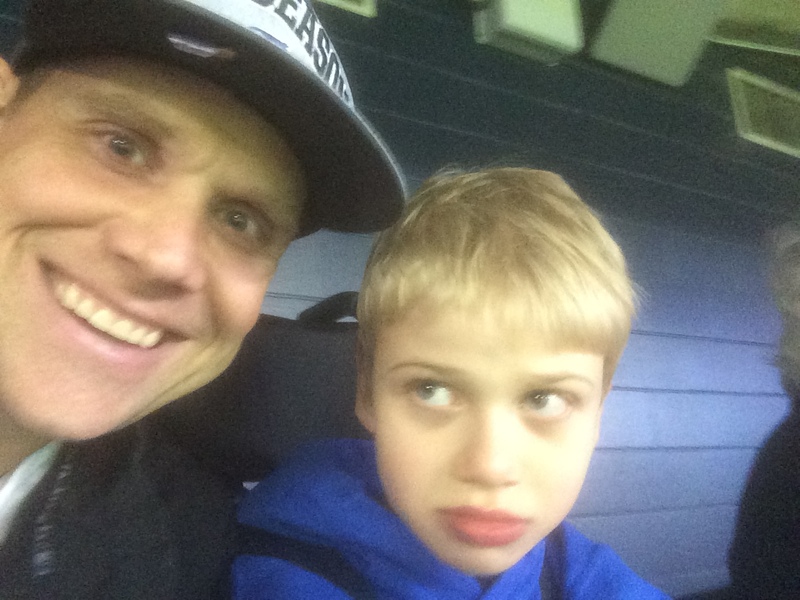 I'm passionate about family, the Toronto Blue Jays, running, social media and technology. Here on keithmcarthur.ca, I haven’t exactly been prolific. In fact, I’ve published just six posts since 2011. But today I launched a new blog where I’m planning to post several times a week. This new blog — myinstructionmanual.com — will chronicle my attempts to live my life to the fullest, to be happier, healthier and more productive. Why am I embarking on this journey? About a year ago, I learned that the chronic kidney disease I’d been coping with for the past 17 years had taken a sudden turn for the worse. My kidneys were failing badly, leaving behind toxins that were slowly poisoning my body and my mind. Fortunately, I was blessed that my sister offered to donate one of her kidneys to me. On April 11, 2017, her kidney was successfully transplanted into my abdomen. I have a chance at a second life and I am determined not to waste it. I’ll be cross-publishing some blog posts here, but if you want to see them all as soon as they’re published, make sure to follow at myinstructionmanual.com. You can find today’s post here. When Muhammad Ali died last month, the world mourned a saint who fought beautifully in the ring and sacrificed himself outside of it to stand up against inequality and unjust wars. And that’s part of who Ali was. But that’s not all he was. Muhammad Ali was a controversial figure, and to smooth out his rough edges is to miss much of the incredible narrative of Ali’s life. It is to miss that Ali initially rejected Martin Luther King’s vision of peaceful desegregation. It is to miss that Ali used hateful speech against his black opponents, attacking them for being Christian and “Uncle Toms.” It is to miss that Ali held dangerous views, not just for the white status quo, but for the mainstream civil rights movement. At his worst, he was mean, sexist and self-obsessed. At his best, he was a kind, generous man who loved to be around people, playing practical jokes and preaching peace and tolerance. The many sides of Cassius Clay / Muhammad Ali are captured in Fighting Words: The Greatest Muhammad Ali Stories Ever Told, which goes on sale today on Amazon for Kindle apps and devices. (The paperback and eBook for other devices will be available soon). Fighting Words is the first release from FanReads, a new publishing company that focuses on fan-based anthologies. The FanReads promise is that we package up the greatest stories ever told for fans of sports, screen and music. In the next few months, we’ll be releasing other books on sports (Toronto Blue Jays), screen (Game of Thrones, Orange is the New Black) and music (The Beatles). Visit us at FanReads to sign up for our mailing list to be the first to know about our newest titles. And go to Amazon today to download Fighting Words. Ali’s story is so appealing because it is a classic redemption arc with a twist. He is a man who falls, goes into exile, and is reborn first as a hero and later as a saint. What makes his story special, however, is that it is bidirectional. When Ali lights the torch at the 1996 Olympic Games, it’s not just that America is forgiving him for his past. Ali himself is forgiving his country. Credit: Gordon Ednle. Used under Creative Commons. Having trouble getting a customer service challenge resolved? Here’s a fail-safe solution: Email the president. Late last year, I placed a large order from a Montreal-based retail chain that recently expanded to Toronto. Their wood furniture was beautiful and so was the in-store experience. But while the brand promise was great, the customer service was a let-down. More than two weeks after paying for my furniture, I called the store to inquire about delivery date and was told to be patient. A few days later I called again. This time, the store representative told me they had no visibility into delivery dates. Emails to the company’s customer service address went unanswered for 20 days. I called the customer service phone number five times over several days and they were also unable to advise on when my order would arrive. I got so frustrated that I did two things. First, I posted on the company’s Facebook page. Second, I emailed the company’s founders. Companies don’t want you to do this. They rarely post executive email addresses on their website. But with a little guesswork, it’s pretty easy to reach the right person. That night I got emails back from both founders as well as a telephone call from the company’s head of operations. On Facebook, a rep let me know my order was being expedited. My Facebook post also elicited responses from a couple other customers who had experienced similar issues. Then the next morning, I received a call from the third-party delivery company to advise that my furniture would come the following morning. Emailing the chief executive officer gets results. I saw the same thing at the telecommunications company I used to work at. Complaints inevitably got answered far more quickly when the CEO knew about them. This is great for customers but terrible for business. An escalation path to your top executive is expensive, inefficient and unfair. Your CEO should be focused on the engine, not the squeaky wheel. Great companies understand that branding is about more than logos, advertising and in-store aesthetics. Brands are defined by fulfillment, operations, delivery and customer service. Amazon gets this. The online retailer almost never misses delivery dates and very often delivers products far sooner than the date they promise. Some of the solutions are obvious. Emails to your customer service team need to be answered promptly. If you need more than one business day to respond, send an auto-reply to let the customer know when they’ll hear back. Make sure your customer service reps can actually service customers. This means they need to have visibility into delivery dates. And here’s a big one that many companies get wrong. Make sure there is always an escalation path for your customer. If your rep can’t help, make sure they are able to get you to someone who can. If not, your customers are going to take to social media. Or email your president. A few years back, my colleagues in the marketing department wanted to honour Canada’s veterans on November 11. They developed a Facebook image of a poppy floating over the company’s branding. While some of our social media followers appreciated the sentiment, others were angry at what they saw as a blatant attempt to brand a solemn memorial. AT&T landed in hot water a couple of years ago when it published what it thought was a beautiful tribute to 9/11 by showing a photo of the twin towers through a cell phone. But my favourite commemorative misstep was the tweet from SpaghettiOs which encouraged followers to take a moment to remember Pearl Harbor. The sentiment might have been fine but the accompanying photo – of a smiling, flag-waving piece of pasta – certainly wasn’t a good way to mark a military attack that killed 2,403 Americans. This year, the Canadian financial institution BMO is recognizing November 11 with a campaign that encourages people to take a moment of silence in social media. The concept is a good one. But when I went to sign up for the program I noticed a BMO logo on the Thunderclap page. The branding in connection with Remembrance Day didn’t sit well with me. Instead of joining in, I asked my social networks how they felt about BMO branding a moment of silence. One friend said it was a “deplorable attempt at branding a universal sentiment.” Another called it a “big misstep” by BMO’s social media department. From personal experience and countless conversations with the smart, well-intentioned people who run social media at North America’s biggest brands, I can tell you that there is rarely a cavalier attempt to sell more pasta or RRSPs by jumping on a cause. More often a content producer or community manager is just trying to create good content about something they care about. In this case, BMO seems to have done things right. They earned the Legion’s support by donating $50,000 to The Royal Canadian Legion Dominion Command Poppy Trust Fund. According to its press release about the initiative, BMO has been ”the Official Bank of the Canadian Defence Community since 2008.” And the social media posts that get sent out on participants’ social media accounts do not mention the bank. But here’s the thing: When it comes to branding around sensitive events, nobody cares about your intentions. It’s all about perception. So far, the reaction to BMOs campaign has been muted. Two hours before the 11am EST, about 2,500 people had pledged their support. And aside from the comments on my Facebook post, there’s not a lot of negativity around the campaign in social media. That might mean BMO has handled a sensitive topic the right way. Or it might mean the bank is just lucky. Remember that controversial 9/11 post from AT&T? A year earlier, the telco published a nearly identical post. The first time, the post garnered only positive feedback. A year later it was seen as a huge #socialmediafail. It only takes one loud and angry influencer people to build a bandwagon others will quickly jump on. Here are three tips to help your brand avoid the minefields that surround tragedies and commemorative anniversaries. Develop a process for going dark. 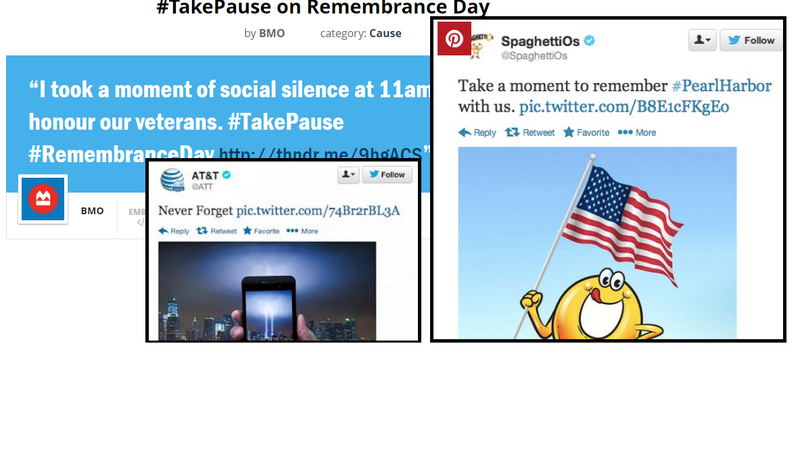 Canadian brands shouldn’t post in social media at 11 o’clock on Remembrance Day (and don’t forget other time zones!) But what if there’s a school shooting or a plane crash? If you tweet about your snack food and everyone else is talking about a tragedy, you’ll look insensitive and completely out of touch with your customers. Be the most cynical version of yourself. Of course you know your intentions are good. But if you were an outsider who already had reason to be skeptical about your brand, what would you think? As I learned in journalism school, if you’ve got any doubt, leave it out. Hide your logo. If it ever looks like you’re trying to brand a cause, you’re doing it wrong. Your company name should be minimal and your logo probably shouldn’t be shown at all. Keith McArthur is founder and chief storyteller at Outfront Strategic Storytelling. He helps great brands discover, create and share their essential stories.